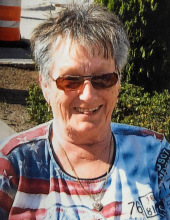 Age 83 of Owosso passed away Saturday, October 27, 2018 at her residence. A Celebration of Martha's Life will be held 11am to 1pm Saturday November 3, 2018 at Nelson-House Funeral Homes, Owosso Chapel. Martha was the daughter of Wayne and Doris (Case) Heiser born in Grand Blanc, MI on March 27, 1935. Martha married Carl W. Baker in Flint on May 16, 1953 and he preceded her in death in 2012. She was an avid bowler, loved her flower garden and was a Detroit Tigers fan. Martha greatly enjoyed traveling and taking vacations with her husband Carl. She loved all the special times spent with her family. Martha is survived by her children, Brenda Sue (Ron) Farner, Brian (Cindy) Baker, Carla Jo (Joe) Burkhamer, Carl James (Teri) Baker and Chris Wayne Baker; 2 grandchildren; 1 great grandchild; only sister Deloras Skolneck; nieces, nephews and other loving family and friends. She was predeceased by her husband; parents and 4 brothers. Memorial contributions are suggested to Memorial Healthcare Hospice. To send flowers or a remembrance gift to the family of Martha L. Baker, please visit our Tribute Store. "Email Address" would like to share the life celebration of Martha L. Baker. Click on the "link" to go to share a favorite memory or leave a condolence message for the family.